Blog – Page 2 – Leben und Lernen in Kenia e. V.
We can now proudly post the honor badges that were awarded to Live and Learn in Kenya Int’l on January 24th for our work in 2017. Instead of the mandatory 36 points necessary to achieve the highest status, we have achieved 320. We are proud of the achievement, but especially of the many hundreds of dollars donated to our projects over the year. The new annual report for 2017 is online! Each year, we are eagerly waiting for Ken’s annual report. Now the report is online. The report has more than 40 illustrated pages. Read about the progress of work on our school center (a new classroom, a beautiful kitchen and a great playground were inaugurated), the visit of a representative of Global Giving from the US or the first participation of our children in a music competition. The new school year began on January 2nd. 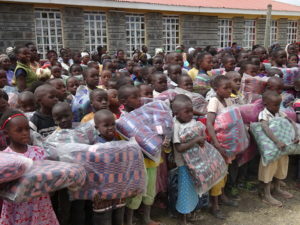 Our school now has a total of 240 pupils. 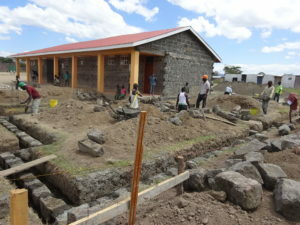 30 children are registered into our newly formed day care class of 3 to 4-year old children will be beginning school at the end of February when the new classroom is completed. 30 children are attending kindergarten and another 30 children are attending preschool. 150 pupils are in grades 1 through 5. Each class is comprised of 15 boys and 15 girls so that there is a total of 120 boy and 120 girls registered at the Live and Learn in Kenya Elementary School. The day was especially exciting for the 30 children, who joined our project in November 2017. It was their first day at our kindergarten. 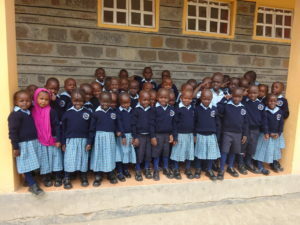 The photo shows them proudly wearing their new school uniforms that they received that day. They weren’t the only ones excited about their first day of school. Our former principal, Linda Wanyonyi, left Nakuru to follow her husband to another part of Kenya. Mustafa Osundwa was greeted as the new principal of the school. The young and dynamic teacher has teaching experience in both public and private schools. He served as the assistant pricipal of Eldoret Education Centre. One of his main objectives is to work in a challenging environment with a team of inovated teachers and pupils. Our annual tradition of giving all of the children and their families Christmas presents is well-loved and anticipated by everyone involved. Last Friday was the happy day when all of the families came to the Center and received a huge food package with flour, rice, cabbages and a live chicken. The families are now ablt to prepare their own, very special, Christmas meal. 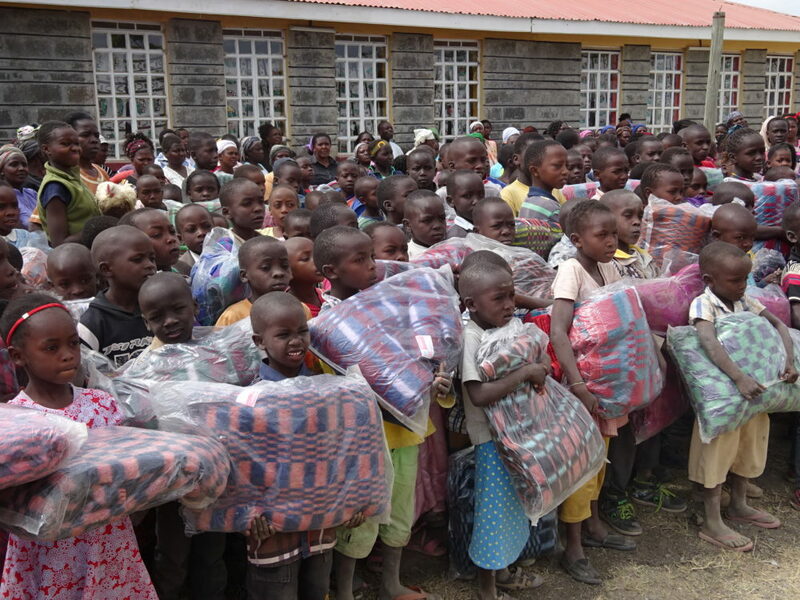 Over 400 children and youths received a big, warm blanket for the cold Nakuru nights. Everybody was elated, as you can see in a short video at https://youtu.be/5bFjvqYm9_E. On their way home the parents were still singing and dancing through the streets. 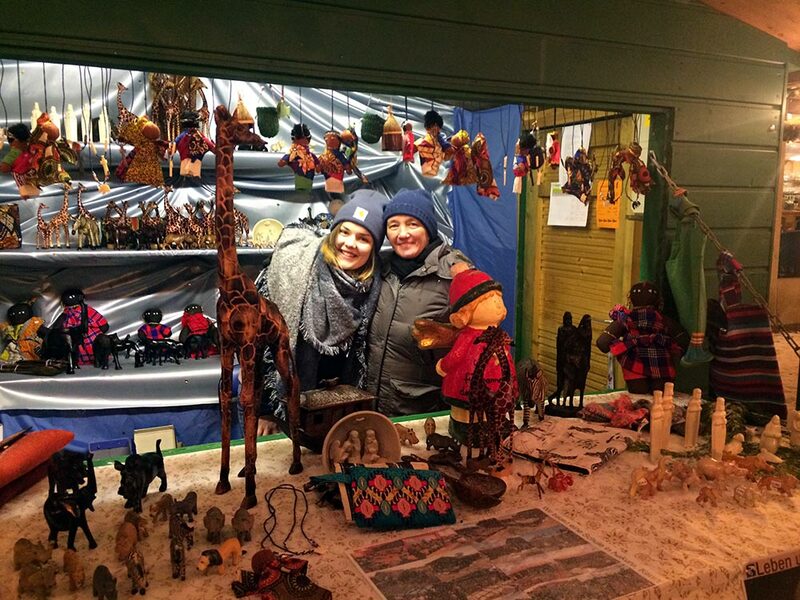 At 2 pm, on Sunday, December 10th we opened the sales hatch of our wooden hut number 6 at the Christmas market in Selb. With snow falling and Santa Claus, who came by with a sack full of sweets, it was really beginning to feel a lot like Christmas! We are selling handcrafted items from Kenya that we brought back from our last visit – for example colorful handbags, uniquely beaded jewelry scarves and carved animals out of wood and soapstone. We also have the possibility to talk to our customers about LLK and the work that we do in Nakuru – which impressed many people. 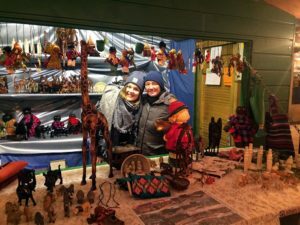 The Christmas market will be open Fridays, Saturdays and Sundays until December 23, 2017. Visit us! Many beautiful things from Kenya are waiting for you. 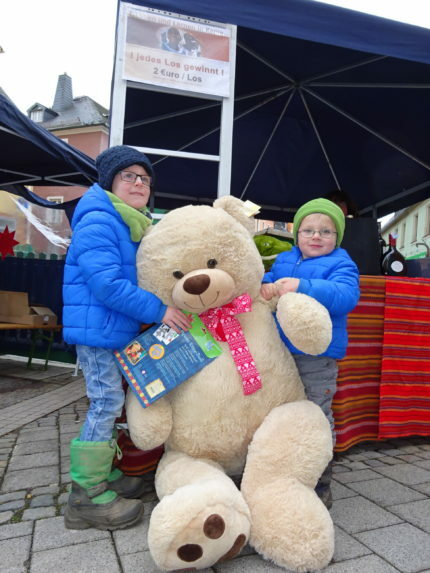 The Christmas market season started in Selb on the first Advent weekend this past Friday. We participated in the traditional charity Christmas bazar with a raffle today. Every raffle ticket won a prize – stuffed animals, wine glasses, high-end porcelain items, necklaces made in Kenya, toys and many more fabulous prizes were up for grabs. Two very excited little boys – Jonas and Max – were the happy winners of a main prize – a huge Teddy Bear – found his way into their playroom! We will be offering more activities at the Christmas market. Please see our event calendar for more information. Giving Tuesday is the special day of the year to think about what you have and what you can give back in the form of a donation to those in need. 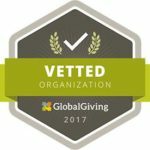 GlobalGiving goes a bit further. 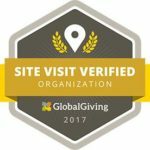 They match donations and give bonuses to the organizations with the most donors and donations all day long. Let’s give them a chance to match your donations today! Despite rainy weather, more than 20 members, sponsors and friends of our organization met for this year’s annual general meeting at the Autohof Thiersheim on Saturday, November 11, 2017. Brique Zeiner and various club members reported on the club’s activities, this year’s trip to Nakuru and much more. There was a lot of applause for the work done. The morethan one and half hours flew by. The minutes of the meeting will be made available to all members in the next few days. 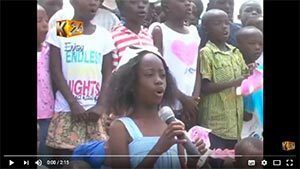 This video about LLK was broadcasted on November 6th, 2017 on National TV Kenya.